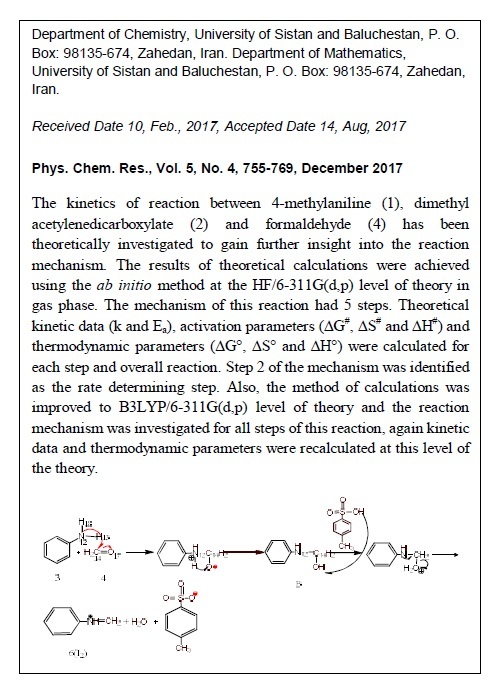 The kinetics of reaction between 4-methylaniline (1), dimethyl acetylenedicarboxylate (2) and formaldehyde (4) has been theoretically investigated to gain further insight into the reaction mechanism. The results of theoretical calculations were achieved using the ab initio method at the HF/6-311g (d, p) level of theory in gas phase. The mechanism of this reaction had 5 steps. Theoretical kinetic data (k and Ea), activation parameters (∆G#, ∆S# and ∆H#) and thermodynamic parameters (∆G̊, ∆S̊ and ∆H̊) were calculated for each step and overall reaction. Step 2 of the mechanism was identified as the rate determining step. 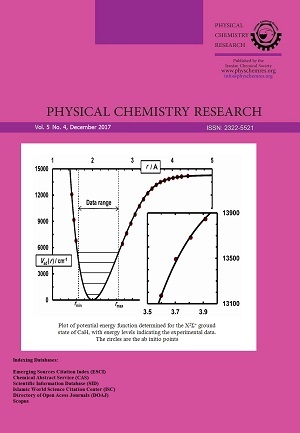 Also, the method of calculations was improved to B3LYP/6-311g (d, p) level of theory and the reaction mechanism was investigated for all steps of this reaction, again kinetic data and thermodynamic parameters were recalculated at this level of the theory. Improved data at this level was in a good agreement with the HF/6-311g (d, p) level of theory. Theoretical results, altogether were compatible with the literature's reports. As expected, step1 and step3 were recognized as the fast and fastest steps among the other steps. The overall reaction was enthalpy-controlled and proceeded chemically-controlled. In addition, step4 was recognized as a relatively slow, due to the five-membered ring formation in this step was inherently an energetically unfavorable.